Julia Streets has been featured on BBC Radio 4’s Today Programme and is a regular guest on BBC Radio Kent’s Drivetime show. On the Drivetime show she discusses her favourite topic of business, comedy and the comedy of business. Julia appeared on the pilot of the Victoria Derbyshire Show on BBC2. Julia was invited back to the Victoria Derbyshire Show in November 2017 to discuss the Autumn Budget. In 2017, Julia began hosting DiverCity Podcast, a podcast looking and Diversity and Inclusion within financial services. In 2018, Julia continues to be the featured guest on the Drivetime show on Radio Kent. 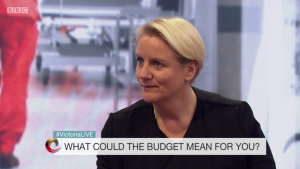 Julia Streets on the Victoria Derbyshire Show: ‘What could the Budget mean for you’. Julia began hosting DiverCity Podcast, a series of podcasts designed to explore the field of diversity and inclusion in financial services.